Why does Ting Mobile get a special dedicated page?! That's probably one of your first questions, as this carrier is not even listed on the main comparison page. I've received a number of emails from visitors to the site who have raved about this little known prepaid wireless provider. In and of itself, that doesn't warrant creating a whole new page dedicated to one carrier, as I receive a lot of emails regarding various different carriers. However, after reviewing their site in detail on numerous occasions, and seeing them evolve over time, I have to say that they really are impressive, and certainly noteworthy. The first, and most important element that stands out is their approach to plan pricing. One of the key benefits of prepaid plans, beyond not having to lock into a contract, has been that you can easily and painlessly change plans to meet your needs. That said, carriers have always counted on customers paying for plans for which they never truly use; we never talk as much, text as much, or use as much data as we expect, thus paying more than we need to. We also usually delay changing plans, for it takes time to figure out what our average usage is, and we have a general fear of running out of data or access to other key services. With Ting, you literally pay AFTER the month ends only for the services you ACTUALLY used. 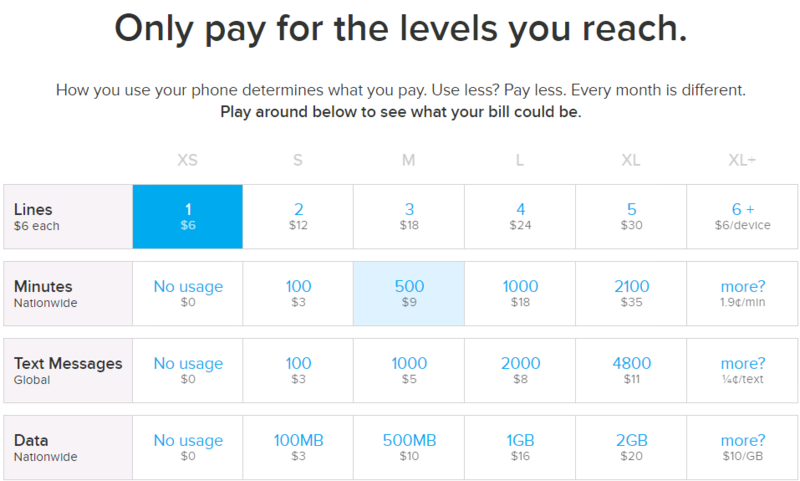 They have a $6 charge per device per month, but voice minutes, text messages, and data are all charged based on your actual usage. There are buckets for each level, providing very reasonable tiers. Hopefully Ting can remain profitable with this model, as a lot of carriers forecast for plans to go partially used, resulting in higher revenue, and lower cost to serve. Unlike most of the large carriers, and even smaller MVNOs, Ting Mobile really seems to delivery on its core principals, which are: Fairness, Clarity, and Realness. As you can see from all of the available plans, and the various nuances within carriers and even within each plan, prepaid has become so complex and confusing. Ting, appears to genuinely believe in keeping things honest and real, and making things super easy to understand. This is truly refreshing. From the feedback I've received from customers who have emailed me, it appears that they are truly executing on these principals, which is very refreshing. Hopefully their integrity can coincide with profitability in the super competitive, low margin business of prepaid wireless. Ting started off with CDMA only on the Sprint network. This limited phone selection and customer network preferences. Currently they also support GSM (with T-Mobile), thus customers can basically bring any unlocked phone with them, and get Ting service. Family members can even have different phone types (CDMA vs. GSM) on the same account, which is super convenient. Ultimately most of the world will be transitioning to LTE technology, and they do support LTE on the T-Mobile network. I expect that they will also transition to LTE with Sprint as well. Ting doesn't charge for voice roaming, which is refreshing. Ting does NOT currently have data roaming, so if you're off network, you won't get data access. Thus, make sure to check their data network coverage to ensure that it will meet your needs. International roaming is supported only on CDMA at this time. In addition to BYOD (Bring Your Own Device), Ting also sells phones directly on its website. Ting also offers Gigabit home Internet, which can be up to 10x faster than some of the most common Internet providers currently available. Their Internet service isn't cheap though at $89/month + $399 installation. Perhaps this newer business will help to subsidize their wireless business so that they can remain profitable? I honestly believe that Ting operates under a different DNA where they truly do believe in a different, more honest and transparent way of doing business. They refer to themselves as a "home to a smarter, fairer approach to cell phone service." They also claim that the average monthly Ting cell phone bill is $23 per phone. Overall, I appreciate their approach, and look forward to hearing from their customers regarding their real world experiences!